A major concern associated with ZIKV infection is the increased incidence of microcephaly with frequent calcifications in infants born from infected mothers. To date, postmortem analysis of the central nervous system (CNS) in congenital infection is limited to individual reports or small series. We report a comprehensive neuropathological study in ten newborn babies infected with ZIKV during pregnancy, including the spinal cords and dorsal root ganglia (DRG), and also muscle, pituitaries, eye, systemic organs, and placentas. Using in situ hybridization (ISH) and electron microscopy, we investigated the role of direct viral infection in the pathogenesis of the lesions. Nine women had Zika symptoms between the 4th and 18th and one in the 28th gestational week. Two babies were born at 32, one at 34 and 36 weeks each and six at term. The cephalic perimeter was reduced in four, and normal or enlarged in six patients, although the brain weights were lower than expected. All had arthrogryposis, except the patient infected at 28 weeks gestation. We defined three patterns of CNS lesions, with different patterns of destructive, calcification, hypoplasia, and migration disturbances. Ventriculomegaly was severe in the first pattern due to midbrain damage with aqueduct stenosis/distortion. The second pattern had small brains and mild/moderate (ex-vacuo) ventriculomegaly. The third pattern, a well-formed brain with mild calcification, coincided with late infection. The absence of descending fibres resulted in hypoplastic basis pontis, pyramids, and cortico-spinal tracts. Spinal motor cell loss explained the intrauterine akinesia, arthrogryposis, and neurogenic muscle atrophy. DRG, dorsal nerve roots, and columns were normal. Lympho-histiocytic inflammation was mild. ISH showed meningeal, germinal matrix, and neocortical infection, consistent with neural progenitors death leading to proliferation and migration disorders. A secondary ischemic process may explain the destructive lesions. 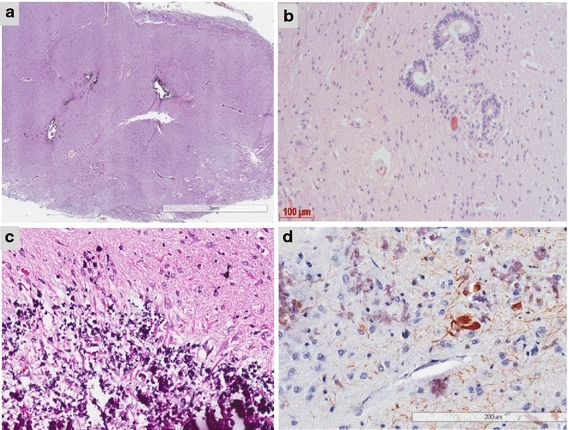 In conclusion, we characterized the destructive and malformative consequences of ZIKV in the nervous system, as reflected in the topography and severity of lesions, anatomic localization of the virus, and timing of infection during gestation. Our findings indicate a developmental vulnerability of the immature CNS, and shed light on possible mechanisms of brain injury of this newly recognized public health threat.